Does not work on a European PS3. (Original Broadcast Presentation, New Widescreen Presentation and the Extras. What high school was like for the rest of us. The modern classic, Freaks And Geeks, arrives on Blu-ray at last! 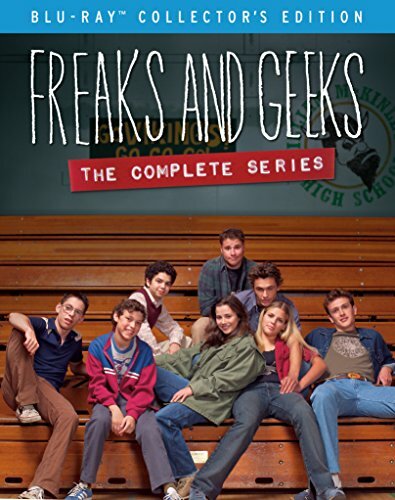 Set in 1980 at the fictional McKinley High in Detroit, Freaks And Geeks focused on two groups of outsiders: the stoners, tough kids and bad girls; and the brains, nerds and squares. Although this Emmy award-winning series ran for only one season, it has remained a cult favorite and a benchmark of quality television. A funny and authentic portrait of high school life with all of its horrors and triumphs, Freaks And Geeks resonates with anybody who has ever felt like they dont quite fit in. The series’ legacy) including the ongoing success of many of its key personnel, from creator Paul Feig (Bridesmaids), to executive producer Judd Apatow (The 40-Year-Old Virgin), to cast members such as Linda Cardellini, Seth Rogen, James Franco, and Jason Segel) is undoubtedly secure in the hearts and minds of its passionate (and ever-growing) fanbase. Jam-packed with a treasure trove of extras, this Blu-ray collection also features all eighteen episodes in both original broadcast aspect ratio and a special widescreen presentation. Join Shout! Factory in celebrating this one-of-a-kind series with a set youll Geek out over.